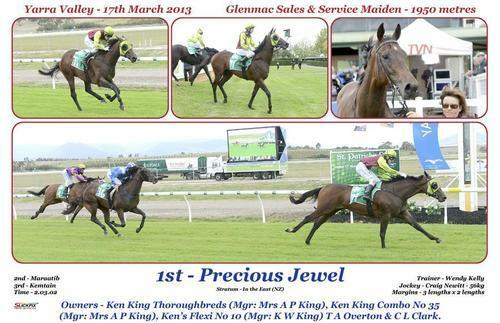 Precious Jewel broke her Maiden status today at her 5th start with a convincing win over 1950m at Yarra Valley. Ridden patient early by jockey Craig Newitt she dashed to the front at the top of the straight win by 3L. A good training effort by Wendy Kelly to step the horse up from 1420m to 1950m and have her run it out so strongly.The 3YO Stratum filly may be a nice staying prospect and really appreciated the step up in distance. Congratulations to our fellow owners Tim Overton, Colin Clark, Manuel & Sue Montabello, Salvatore Zaffino, Samatha Colquhoun, Ken's Flexi 10 partners and Combo 35 partners.